Siomha Cunniffe, Development Manager for STOPAIDS shares with us what the organisation is about, what they get up to and how you can get your Company involved. STOPAIDS is a network of 80 UK agencies working since 1986 to secure an effective global response to HIV and AIDS. Our key role during the last thirty years has been to convene members to share and agree effective policy and programmatic HIV-related practice and build a united platform to influence the UK government and other UK actors to play a leading role in the global HIV response. HIV is still one of the greatest global killers and there is much to do. AIDS is the biggest killer of women of reproductive age globally. AIDS is also the second biggest killer of adolescents globally and the number one killer of adolescents in Africa. It is estimated that 19 million people do not yet know they are HIV positive and a total of 26 million people would benefit from ARV access but do not yet have it. Huge social, cultural and legal barriers must be overcome to get appropriate services to those most affected by the disease. Through our advocacy, we work to secure UK leadership as an essential contribution to an effective and ambitious global response to HIV. Through our information exchange, we provide platforms for members to share information, best practice, expertise, and offer peer support across the breadth of HIV and AIDS issues. Drawing on over 30 years’ experience of working in HIV and AIDS, STOPAIDS also undertakes consultancy and generates a number of resources. Do you want to be a part of positive local and global change? Do you believe that if the world can end AIDS and save millions of lives, then we should do it? If you want to meet like-minded young people, learn more about HIV & AIDS and international development, build your skills, gain experience in campaigning and be part of our exciting network then join us at Youth Stop AIDS! Youth Stop AIDS is a youth-led movement campaigning for a world without AIDS. We want zero new HIV infections, zero stigma and discrimination and zero AIDS-related deaths. As a global community, we know how to end AIDS – failing to do so is unjust and morally unacceptable. That’s why our network of young people across the UK speak out, take direct action, lobby and raise awareness to make sure that those with the power to make a difference, like citizens, governments and corporations, are committed to ending AIDS by 2030. World AIDS Day is held on 1st December each year and is an opportunity for people worldwide to unite in the fight against HIV. Could your Company get involved? World AIDS Day is an opportunity for you to learn the facts about HIV and put your knowledge into action. You can also show your support for people living with HIV on World AIDS Day by wearing a red ribbon, the international symbol of HIV awareness and support. 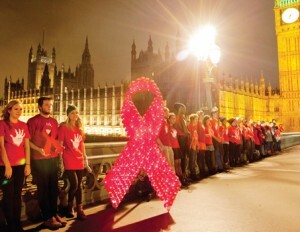 Sign up to our newsletter at youthstopaids.org/signup, follow us on Twitter @youth_stopAIDS and Facebook. Come to our National Gathering (30th Oct – 1st Nov 2015) in Sheffield; email Tabby, the Campaign Coordinator at tabby@restlessdevelopment.org for more details.